-	manage main tanks (CTRA/ORA compatible) and personally selected players. VuhDo video tutorial on YouTube: Part 1 Part 2 (Thanks Bellamie). Yet another video guide (Thanks Eressea). Video tutorial on advanced features: unboxing and cluster scanner (Thanks Joseph/Apristine). Collection of guides and tutorials (Thanks Zohar). -- Added ability to track Holy Priest "Trail of Light"
-- Beware you will loose all previous custom debuff settings! -- Added custom flag validator which accepts a user defined function. -- Bouquets can include any valid Lua function which returns true or false. -- containing the relevant unit information. -- UnitGetIncomingHeals API seems to return bogus values on beta/PTR? -- Use Hamlet's updated spreadsheet for WoD? 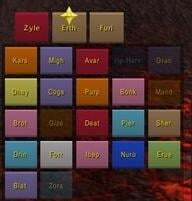 -- Some checkboxes Options=>General=>Misc changed to "enable"
-- Added new bouquet item "Statusbar: Overshielded"
-- Added monk abilities to default bouquet "tank cooldowns extd"
"Mana Bar", "Side Left", "Side Right". -- Added bouquet item for counter "Counter: All shields absorb #k"
-- Added bouquet item "flag: class color if active"
tri-state now. So you can "leave alone/show/hide blizz" frames. Change the colour of the HP-bar to change its colour for all units with Felinfusion (a debuff). Unfortunately simply adding it as debuff automatically makes the bar show the duration of this debuff as length of the bar instead of showing current hitpoints, which I'd like to avoid. To circumvent this I tried to set up a custom flag that would check for the presence of the debuff, but somehow the only help the tooltip offers is useless for anything but checking things one can guess "VUHDO_anInfo["_"] might take as an argument (like "name", "dead", etc.). How do I write a custom flag that checks for the presence of a specific (de)buff? I'm wondering how I can set multiple panels to appear when I have a 5-man party, and when I have 10-40 man raid. I have 2 panels setup, and would like to see the 5-man only during a 5-man dungeon in panel 1, and anything 10-40 will show the raid frames in panel 2. Is this do-able? If so, how do I go about doing so? I was wondering how can I change the default role icons to something a bit more "modern?" I'd rather have them flat upon the frames rather than the default "raised" button appearance. Thank you in advance. You cannot do this with VuhDo today. Honestly the add-on was designed to be a replacement for party and raid frames and not really player frames. I use a custom oUF layout for player, target and focus frames myself in addition to showing target, focus and boss units in VuhDo. Is it possible that in all my years of using Vuhdo that I don't know how to add portraits to my panels or is this a feature that is not available? I love that I can add a panel for my "Self" and for my "Target" (and focus). If I could add portraits to these panels then I could skip looking for a ui replacement suite (and disable most of the features anyway). Having a box on my screen with my name doesn't quite work without having a portrait attached to it. If this is not a feature then could it be considered? 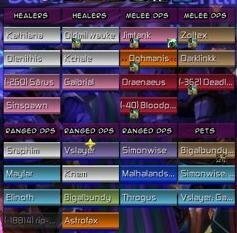 Or is there another addon that would work with vuhdo to add portraits to specific panels? is there a way to change the skin of the ready check icon? Not easily. The images are in VuhDo/Images/; icon_info.tga, icon_check_2.tga, and icon_cancel_1.tga. Simply bind the command "target" to shift + left button under 'VuhDo Options > Spells > Mouse'. How can I make it so that the raid frames let me shift+click on a raid frame to target someone (like how you just click on the target frame) since I would like to be holding down shift already to heal multiple people? EG. shift+click "Joe" The Fire mage. It would stop me from having to press shift. Unpress, shift, unshift. Etc. I tried looking through the settings couldn't find anything. Thanks! I know this is super old but this was in an addon pack i downloaded and i really love it just this one small problem thanks! Last edited by cookies_monsters : 08-09-16 at 04:24 AM. 3. Native ready check events will only broadcast to you from wow client if you're assistant at least. 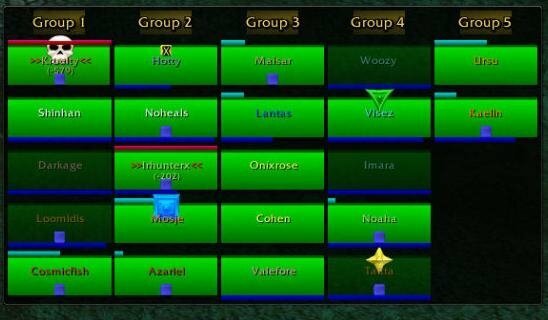 Other addons may use proprietary mechanics to share events between all raid members. Is this still the case, my wife uses default raid frames, and they show without assist, they also show up on the raid tab on the social panel. I believe they removed this restriction awhile ago. Now anyone can see the response to ready checks without need for raid priv elevation. Last edited by Ivaria : 10-17-14 at 02:07 AM. during the work for the WoD version of VuhDo, it will be hosted on its Curseforge page as alpha version. Updates WoWI will be less frequent. If you encounter any bugs with the upcoming versions, please visit us there. Last edited by humfras : 08-08-14 at 06:00 AM. I have Shadowfiend bound to Mouse Wheel Down (no modifier). Yet, when I use it, it casts (or tries to cast) Guardian Spirit, which is what I have for friendlies. I can put it in Shift+Mouse Wheel Down and it works fine. But I'd rather not shift! Or inadvertently cast Guiding Spirit when it's not needed. I just finally figured out what spell works best where for me and it broke. I don't know if it had anything to do with upgrading today? I pre-purchased the next expansion, which included Mists of Pandaria. I even deleted Vuhdo, reinstalled, and set everything back up and it's still doing it. Anyone else having this problem? Do I have something set wrong? After spending way too much time fiddling with the settings, it was a simple fix. The problem is with Guardian Spirit. If Guardian Spirit is bound to the mouse, the corresponding hostile bind must be left blank or it will cast Guardian Spirit even if your cursor is over a hostile target. Last edited by Llyria : 03-28-14 at 02:04 PM. Seem to be having an issue with the buff tracker tracking the armor buffs (molten, etc) for mages. Have checked my settings and have buffs enabled. Seems to work with all other buffs. First time that I have ever run into an issue with Vuhdo, I use it on all my toons!! Great Add On! There seems to be a bug with custom debuffs in the current vuhdo build (running 3.53). I added "Mark of the Wild" to my de/buffs so I can adjust the visual appearance of the icon. After I was done configuring I naturally removed this buff again. Now whenever I load a different profile the MOW buffs immediately shows up on this new profile, it does however go away if you just open and close the vuhdo-config dialog. They main problem is that MOW is not in the de/buff list anymore so I cant remove it - just adding it and re-removing it again doesnt solve the problem either. I have checked the vuho config lua files and MOW it is still in there... I guess manually removing it there will solve my problem... its seems to be a bug in any case though. Actually its really annoying that vuhdo is so awesome when it comes to showing you previews of almost everything while configuring it - yet most bouquets and, most annoying of all, the custom debuffs are never shown. You have to work around this by adding some common buffs or inviting someone... and in the end I always forget something... it would be really nice to at least have previews for de/buffs and or hots (I guess bouquets are kind of difficult). Ok I just played around with it a little and after cycling through all my profiles the MOW bufff suddenly showed up on one of my profiles, I removed it there and now the problem is gone. Its still odd that the buff appeared on all the other profiles too but wasnt in the de/buffs list. Last edited by idewayne : 09-21-13 at 08:09 AM.